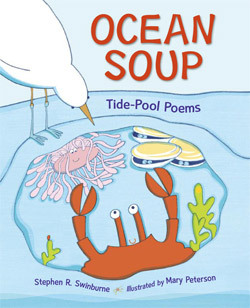 This brightly illustrated, large-format book offers a collection of poems in the voices of tide-pool animals, including the barnacle, sea urchin, sculpin, mussel, starfish, hermit crab, anemone, and lobster. Each species is presented through first-person verse and a paragraph of information. For instance, in "Hairy Doris," a sea slug introduces herself in four verses beginning and ending with "Hello, my name is Doris. / I'm a shell-less gastropod,/ but you can call me 'sea slug,'/ if gastropod sounds odd." On the facing page, a few sentences comment on the animal's appearance, senses, and feeding habits. A colorful large-scale illustration stretches across both pages. Clean, curving pencil lines with digitally added colors portray the animals in child-friendly, cartoon-style pictures. A glossary and a list of recommended resources are appended. 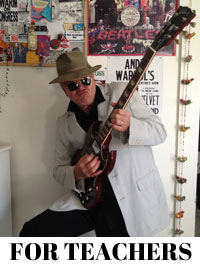 Swinburne, whose science writing includes Saving Manatees (2006) and Armadillo Trail (2008), shows his lighter side here, in pleasing and sometimes amusing verse.